Hello! Bonjour! Ni hao! Hallo! Hei! Aloha! Saluton! Guten Tag! The BlogClan Fan-Fiction project has resurrected from the dead! The name you all chose in poll was: Trailing Stars!! The following are the current job positions. Note that all inactive members have been wiped from the list and replaced with people from the Jar. If you were formerly on the list and wish to reaffirm that you are able to write, please leave a comment informing us. Chapter 1: First person. The person wakes up and finds they are a cat. A sign from StarClan sets the scene – who, what, where, why, how? This reveals a background as to why BlogClan are there. Chapters 2-5: BlogClan starts to congregate, with a few members joining each chapter. Some have found each other on the journey. A basic hierarchy begins- with Cakestar taking charge and Copperclaw as deputy. A hunting patrol is attempted but fails dismally and herb collections begin, though it is difficult to determine which herbs are which. Chapter 6: All members are now here, it is thought. Because there is so little food, a patrol is taken to Twolegplace to find food. Chapter 7: However, this seems to be a bad idea as many cats develop bellyaches. Dawnmist knows that juniper berries will heal this, but nobody can find any from a vague description. Chapters 8 and 9: Bellyaches get worse but a few hopeful pieces of prey are caught. These go mostly to Minnie and to the youngest members of BlogClan. Chapter 10: Cakestar orders dens to be built. The author of this chapter either helps to build them or collects moss, or both. Chapter 11: A warrior races back to camp bringing news of a nearby badger. The author of this chapter (if he/she is a warrior) is put in charge of battle training. Chapter 12: The first border patrol is carried out, and herbs are taken back to camp (identified as marigold). More signs of badgers are seen. Chapter 13: Clan life continues but Cakestar falls ill with greencough. Dawnmist and Silverpaw choose the author of this chapter to visit Twolegplace to find catmint. Prey is still scarce. Chapters 14 and 15: A hunting patrol goes out deeper into the forest and manages to catch a large squirrel and a mouse. This is the most successful hunt yet, and a cause of celebration for many cats. Chapter 16: The author of this chapter has a violent argument with another cat and sides begin to build up. This forms a rift in the clan and many are concerned. Chapter 17: StarClan send a warning about the effects the argument may have and Cakestar, who is still weak from greencough, calls a clan meeting to discuss it. Chapters 18 and 19: A patrol runs into the badger and despite the training are badly defeated. Chapter 21: While gathering the herb from around the fox den, the patrol realise there are young fox cubs in the den. Realising that this makes their mission even more dangerous, the patrol manages to escape before the mother fox returns. Does the angry mother fox track their scent? Chapter 22 The patrol arrives back (the author must decide whether they managed to get the herbs or not). Plans for attacking the badger begin. The cats decide to set a trap, rather than to fight and start to prepare it. Chapter 23: The trap is set, and a patrol is taken to chase or lure the badger into the trap. The chapter finishes with the badger successfully caught. Chapter 24: Many warriors want to kill the badger, but Cakestar decides to let it free. This choice is met with anger, but it is done and the badger runs away. Chapter 25: There is celebration at this victory, and for the first time every cat is fully fed. Chapter 26: Tying up loose ends- arguments are resolved, Cakestar is fully recovered, etc. Chapter 27: StarClan appear to every member of BlogClan and congratulate them. The key people in the story are addressed by StarClan, and applauded. Finally, everybody falls asleep. Chapter 28: First person. The author wakes up in the real world and checks the blog to find that there is a new blog post about the dream. 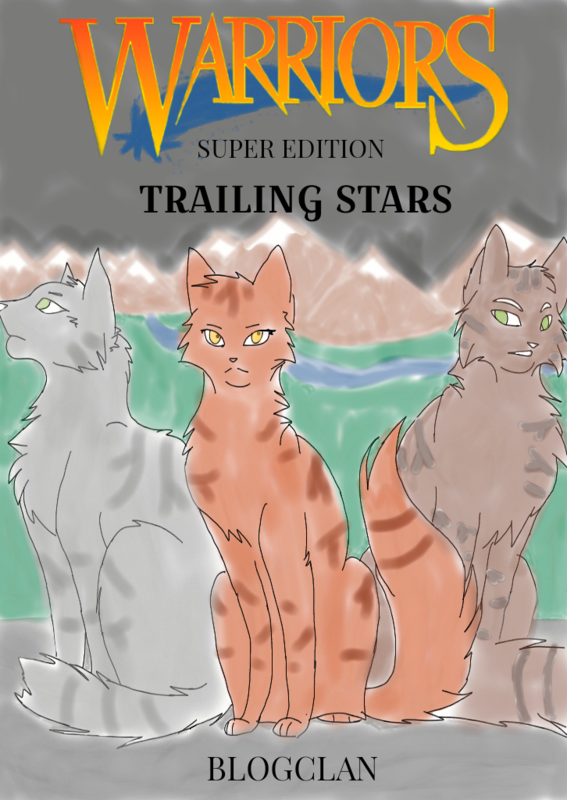 Trailing Stars is a collaborative fan fiction written by members of the Blog. In Trailing Stars, all of the members of the Blog have been transformed mysteriously into cats. They must unite together and live as a functioning Clan, lest they remain as cats forever. Can I write a chapter/edit a chapter? The Jar is an adorable little jar of Kate’s that holds the names of potential writers and editors for the chapters. You can ask Kate to be put in The Jar if you’d like to have the chance to write a chapter. Please wait until you’ve been on BlogClan for at least two months to request to be put in the Jar. He’s often called Jerry. Want to be in the Jar? When do chapters come out? Chapters come out when the writers finish them. Most of us involved in the project are students ourselves. We all have very busy lives, and we try to set the goal to have a lot of words done over a few weeks. You can help simply by standing by and supporting the writers! We’re all very involved when we comment our replies to chapters and help locate missing writers. Can I be in the book? Will Copperclaw, Dawnmist, and Silverwind keep their ranks in the book? Yes! For the sake of continuity and to save us of confusion, the two will keep their ranks. However, if we were to create another project after this one is finished, the ranking will be “passed on” to the next deputy, medicine cat, and medicine cat apprentice.